To provide innovative management education comparable to International standards at affordable cost, keeping Indian culture and ethos in mind. A perfect blend of fun and learning is what defines life @ ITM in a single sentence. The academic block boasts of auditorium, seminar halls and spacious classrooms accommodating 60 students at one time and is access orized with the latest Technology viz, LCD Projectors, Wireless Internet. Spread over 3.5 acres of lush green campus along with well furnished hostels and administrative building ITM-Bangalore provides the apt homely ambience for high intellectual pursuit. The Library continues to offer a ‘hybrid library’ service, combining paper and electronic resources as appropriate in each subject area. The Library meets the challenge of providing an integrated infrastructure for research, by expanding the digital library and at the same time safeguarding the print collections that still underpin research in many subjects. It is well stocked with 23565 books, both general and specialized, around 100 national and international journals,100 video titles 250 compact discs, the library represent the facial point of all intellectual activities in the B school. State of the art development lab, ERP lab, application lab & the internet lab with icore 3 and multimedia capacity nodes and high-end servers on a LAN for imparting education. It is compulsory for all students at ITM to own a laptop individually as part of the curriculum. The internet is fast emerging as an essential tool in modern business education. ITM Business School Bangalore has made no compromises, asserting this belief that internet is more a knowledge base than a mere communication tool. The class rooms and reading rooms are networked to enable the effective use of laptops. Apart from this the entire functional areas are Wireless networked with high speed 4Mbps leased line in the ratio of 1:1. Apart from a conducive academic environment for the intellectual development, the various conduits and committees for a myriad of activities ensures a streamlined process which contributes towards augmenting the all round personality of ITMites. 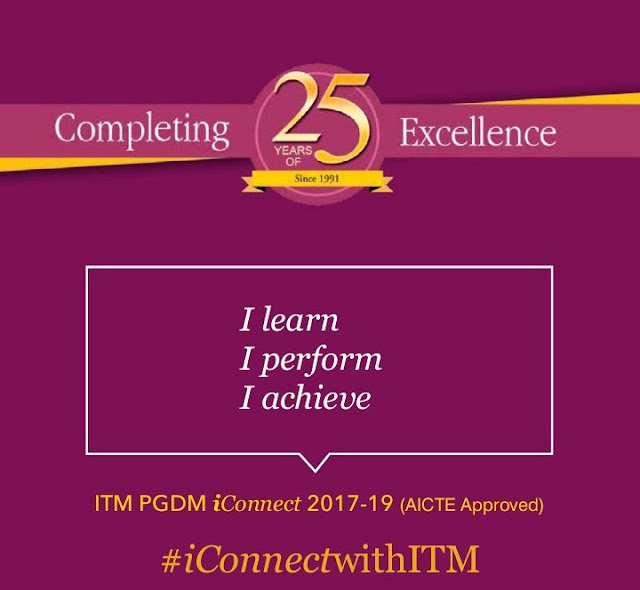 • The ITM Bangalore pedagogical approach focuses on case-based learning that tests the students’ ability to analyze, assess and act by putting them in the decision-makers position. • Additionally, the faculty guided Industry Immersion program at the end of the first year gives students the opportunity to apply their knowledge in a live business environment before coming back to the institution to share their leanings..
• Practicum programs such as the Business Simulation Lab, a part of the Strategy course, allow students to learn from applying theoretical concepts to simulated real world environment. • For the 1st time in ITM Bangalore the students are being given intensive training in Digital Marketing by various Industry Experts in collaboration with DMTI, Mumbai. Ranked 26th Under Outstanding B-Schools of Excellence by CSR-GHRD Rankings of India's best B-Schools 2016 & 12 in Karnataka. Rated A+ by Business India Magazine in the Dec 2016 Edition. Rated AAA by Career 360 Magazine, In India's Top B-School, Nov 2016 Edition. Ranked 34th in the south zone by GHRDC 2015. 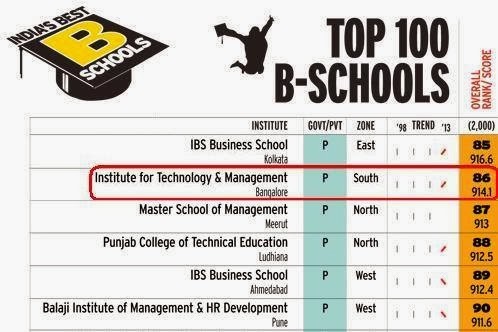 Ranked 9th among the top B-Schools in Bangalore by Business Today 2015. ITM Bangalore. Powered by Blogger.